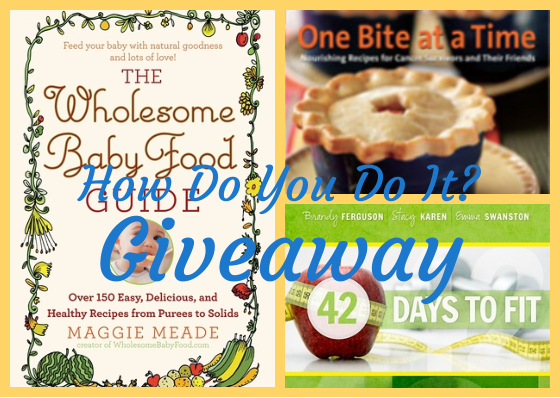 Giveaway: Nutrition and Fitness Books | How Do You Do It? Welcome to Day 2 of parenting book review week! 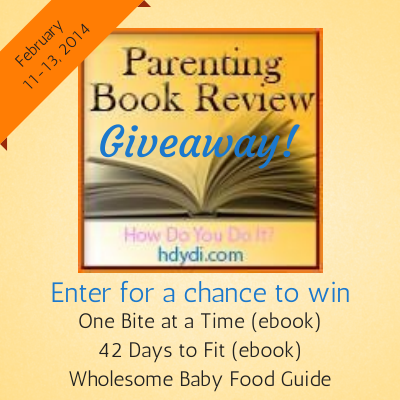 Today’s giveaway is a package of books for keeping mommy fit and baby well-fed! This one’s for all parents with wee ones, regardless of whether they’re multiples, so tell your friends with singletons too. You can win ebooks One Bite at a Time, Revised: Nourishing Recipes for Cancer Survivors and Their Friends and 42 Days to Fit as well as a hard copy of The Wholesome Baby Food Guide: Over 150 Easy, Delicious, and Healthy Recipes from Purees to Solids . Just leave us a comment on any post from this week to enter the giveaway! Don’t forget to let your mommy friends know! I find that figuring out what to feed my son is the biggest struggle each day! Doesn’t help that he is very opinionated! 42 Days to Fit looks great and easy for a busy mom to follow. Thanks for the review and the giveaway. Pingback: Giveaway: Books for Expectant and New Parents of Multiples - How Do You Do It? Pingback: Giveaway: Must-Have Parenting Books - How Do You Do It?